In case you haven’t figured it out already from my social media posts, Logan and I are very anxiously awaiting the arrival of our little girl! 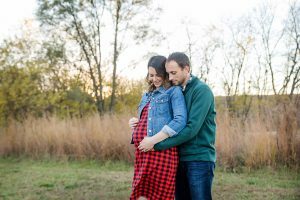 Her due date was yesterday, so we are more than ready for her! Looks like she already takes after her mama and runs fashionably late. 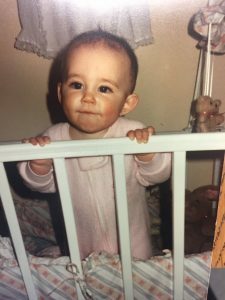 I thought it would be fun to do a little flashback post of some of our own baby pictures as we prepare for Baby W’s arrival. 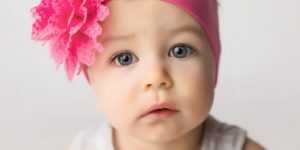 I wonder who she will look more like, or if she will be a perfect combination of both of us! We can’t wait! 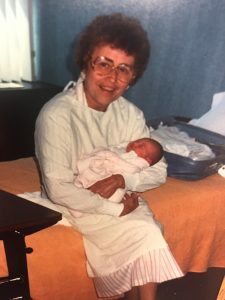 When I was born, my parents were so excited to dig out their own newborn pictures to see who I looked more like, and there was not one baby picture of my dad, who was the youngest of four in his family. 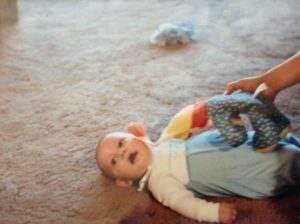 Not one picture until he was about three years old – haha! 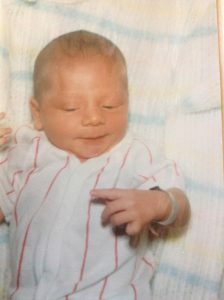 So anyway, I’m pretty impressed with all of the baby pictures Logan’s parents have of him! 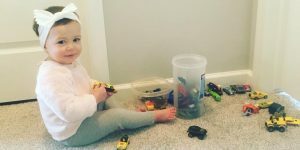 He and his older two siblings are each 16 months apart, so they had to be pretty busy parents when they welcomed their third child, but still managed to find time to snap a few pictures. 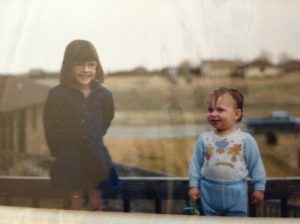 Look at that stylin’ outfit! 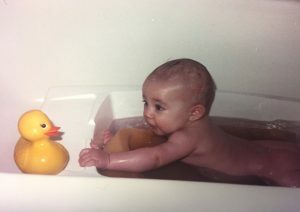 Wasn’t he a cutie? I just love that little smirk! I’m loving this corduroy suit / bowtie combo! 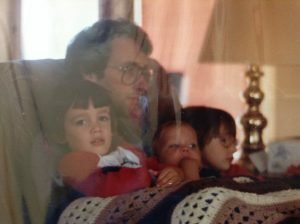 All 3 kiddos on Loy’s lap… I’m so excited to watch Logan as a dad! He looks like he’s up to no good. According to Logan’s mom, he was the sneakiest of the 4 kids. 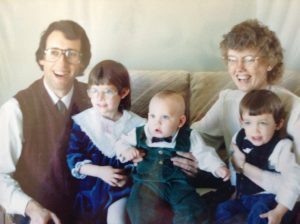 I was the first-born in my family and as the story goes, my parents were told I was a boy. So imagine their surprise when I made my arrival! 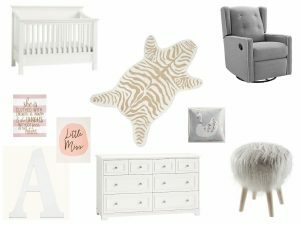 I’m really hoping our ultrasound tech was right with our baby, or baby boy will have a pretty girly nursery and plenty of pink outfits and accessories to choose from! 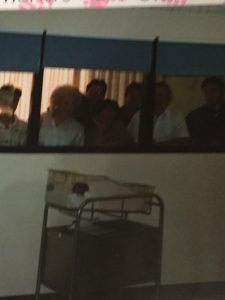 This first picture is kind of hard to see, but I love seeing all of the faces looking in at baby me in the hospital nursery. 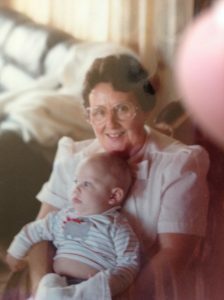 My Grannie Annie was also a 4th grade teacher and had the best sense of humor. I remember loving to play with her jewelry, snacking on wafer cookies and rainbow sherbert in her kitchen and listening to her read Shel Silverstein poems with the best expression! These are my grandparents on my mom’s side, Virginia and Earl. My grandma loved to shop (surprise, surprise) and I remember her always wearing fancy shoes and clothes. 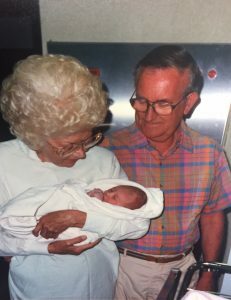 My grandpa had the kindest, gentlest spirit. 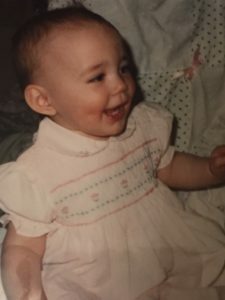 When they saw me for the first time, my grandma said “Where on earth did she get those dimples from?” and my grandpa replied, “You’ve been married to me for 35 years and you never noticed my dimples?” I love that story! There’s that dimple I was talking about earlier … I wonder if our little girl will have one! That’s all for today! 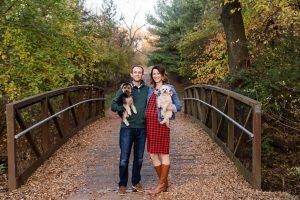 I’m hoping our next post will be a baby announcement, but we’ll see! I’m so curious to see which features from each of us our little girl will have and to watch her personality develop. Hurry up, little one! Happy Wednesday, friends! We are now 6 days away from Baby’s due date and I can’t even explain how excited we are to meet her! We’ve been doing some serious nesting around here, so we are more than ready for her any time! I’ve already started thinking about Baby’s first holiday outside the womb, which will be Valentine’s Day. She’s going to need a cute outfit or two to celebrate the day of love! 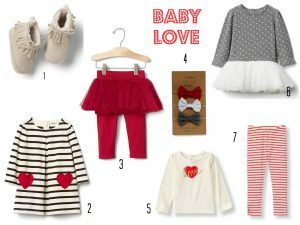 I’m rounding up some of my favorite picks for little girls to celebrate Valentine’s Day in style. Just click the corresponding link below the picture to shop all of the looks. 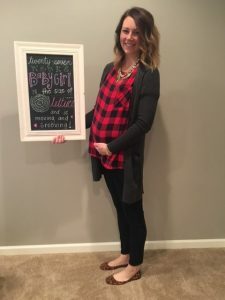 It’s been a few weeks since my last “bumpdate” and Baby and I had our 38 week appointment today, so I thought it was probably time for one again! 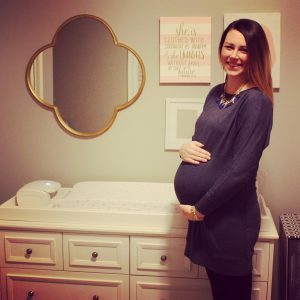 Logan and I are definitely anticipating Baby’s arrival at this point and just cannot wait to meet her! 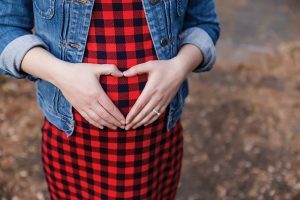 I haven’t felt any contractions yet, but I have been feeling more intense movement – enough to remind me there’s definitely a human inside me! It has been fun to feel little limbs poking out of my belly, but also a little weird visibly see and feel tiny hands and feet! Like I said, we had our 38 week appointment yesterday. 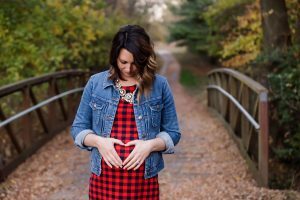 We went in excited and hopeful that Baby might be showing some signals of impending labor, but left the doctor’s office a little disappointed because there really hasn’t been a whole lot of change. 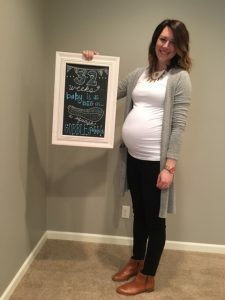 The doctor reminded us again that this will probably be a due date (or later) baby, as she still seems pretty cozy in there! I’m hoping we may see a little more action next week! I think these next few weeks may pass pretty slowly as we anticipate Baby’s arrival! Thanks so much for stopping by today! If you follow me on Instagram, I’m co-hosting a “Back to School” winter fashion week challenge next week with some fellow fashionista teachers. Head on over to check out some great outfit inspiration, or use #btsfashionweek to share some of your own looks! 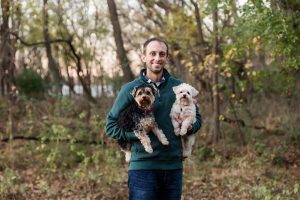 Just wanted to share a few of our Christmas card photos with you taken by the fabulous Kristin Polking. 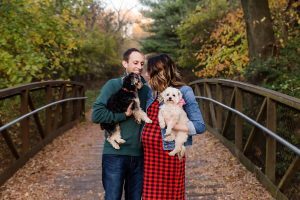 Logan HATES to have his picture taken, but agreed to some Christmas card / maternity photos as long as Kristin was taking them! She’s easy to work with, reasonably priced, super talented and always smiling! If you’re in the Omaha area, be sure to check her out! Let me start by saying New Years Eve isn’t my favorite holiday, but I still enjoy celebrating with friends! Neither Logan nor I really like to “party,” so we usually end up hanging out with a small group of friends or going to dinner and a movie just the two of us. We’re lucky if we’re able to stay up past midnight … old married couple alert! Last year for some reason, I decided we should host our own New Years Eve party, and I do have to say it was A LOT of fun! We served a variety of drinks and appetizers and had our guests bring snacks to share. Great food is a MUST for an awesome New Year’s Eve party! 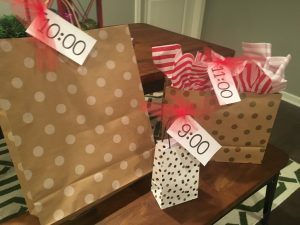 The biggest hit of the party, though, were these gift bags that we opened at 9:00, 10:00 and 11:00. The first two contained games and the last one contained noisemakers and party hats for ringing in the new year. Our guests couldn’t wait for the next hour to see what was in the next bag! This kept everyone guessing and entertained. Even those who had said they were only going to stop by for awhile ended up staying the whole night! The first game (9:00) was matching celebrities to their New Year’s resolution and the second game (10:00) was a trivia game about pop culture, sports and news from the past year. Our guests had to divide into three teams and write their responses on white boards – yes, my inner teacher is always a part of me! It was so funny how competitive everyone was, especially the guys! 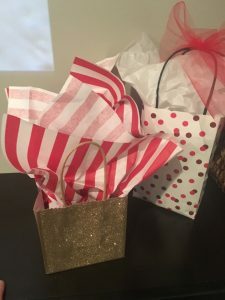 The winner of each game got to choose a gift bag of their own, which contained a $16 gift card (get it? 2016?) I think I had the winning team of the second game go head to head in a sudden death round to figure out who would get the gift card. Hello… teacher salary, remember? 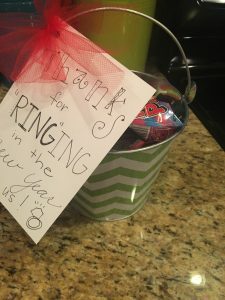 And before everyone left, they got a ring pop to take home to thank them for ringing in the new year with us. Because who doesn’t love a ring pop?! This was my favorite picture of the night – celebrating with my best girlfriends! Like I said, the last gift bag contained party hats and noisemakers for ringing in the new year. We had a projector installed when we finished our basement, so watching big events like football games, the Bachelor (duh), and the ball drop are extra fun on the big screen! 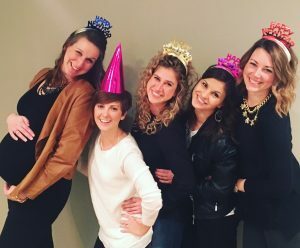 I’m thinking this year’s New Year’s Eve may be a little more low key for Logan and I. I’m not feeling super motivated to plan another party at 36 weeks pregnant, but I do hope to host a NYE party again sometime! How will you be ringing in 2017? 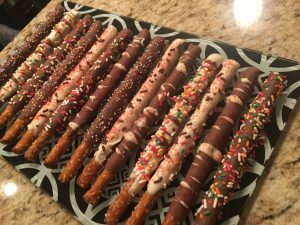 Check out my New Years Pinterest board for more fun ideas! Merry Christmas, everyone! I love this time of year. I love the decorations, the cookies, the gift giving, and of course celebrating the birth of Jesus Christ, our Lord and Savior. It’s so fun to get dressed up and spend time with family and friends! I put together a few different looks for all of your holiday style needs: a Christmas party look, winter wedding and Christmas Eve service. Enjoy! I’m a little obsessed with this dress (which also comes in petite sizes and black), but since my bump can’t fit into it this holiday season, you better wear it in my honor! I’m thinking it would look darling with a pair of polka dot tights and red pumps. A little bling will top off the look and make you sparkle! You’ll be best dressed at the holiday party – for sure! Ladies, I can’t say enough about this dress. The sequin and tweed detail and fringed hemline make it simply amazing! The shoes are absolutely gorgeous and perfect for tall girls like me, and these earrings are to die for and well worth the price. 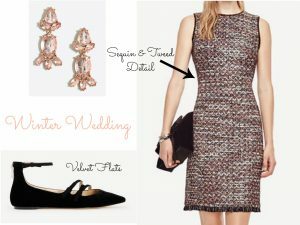 Throw on a black cardigan or jacket and a pair of opaque black tights and you’re set – such a classy look for a winter wedding! I love dressing up for church on Christmas Eve! It’s important to dress modestly, but you can still have a little fun with accessories (hello, adorable necklace and studs!) and fun details like bows, pleats and lace. 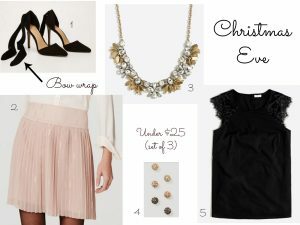 I also think this classic, feminine look would be so cute for a holiday party. Thanks so much for stopping by today! I’d love to hear about your favorite holiday looks, or use #januaryandjune to show me your holiday style on Instagram! 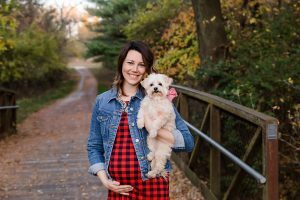 When I first found out I was pregnant, I couldn’t wait to start taking some cute bump photos to document Baby’s growth. I enjoy being a little artsy fartsy from time to time, so I opted to decorate a chalkboard each week (which actually ended up being more like once a month), rather than using an app or something else. I will say, the downside to using a chalkboard is it can be time consuming to keep it updated, especially if you’re like me and have to make each week’s board design a little better than the week before. 🙂 I tried to take a cute photo of the bump on the weeks I didn’t get the board decorated, like at the pumpkin patch, holding the fruit or veggie that baby was the size of, on the porch for the first day of school, etc. Just wanted to share a few of these photos with you all today so that you can see Baby’s progress, too! Isn’t it amazing how much bigger she’s grown from Week 14 to 32?! A few more notes: I used chalkboard markers from Hobby Lobby for each design and a Magic Eraser to remove the marker. 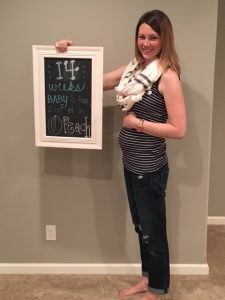 I use my app from “The Bump” to stay updated on Baby’s growth and pregnancy symptoms each week. It also tells me which fruit or veggie she’s the size of in order to update my board. 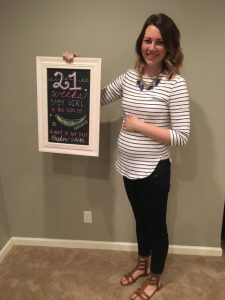 I’m not sure how I plan to use the chalkboard after Baby is here, but have thought about continuing to use it to document her growth from month to month, or updating it with quotes or Bible verses to hang in our entryway from the garage. Welcome to January & June! 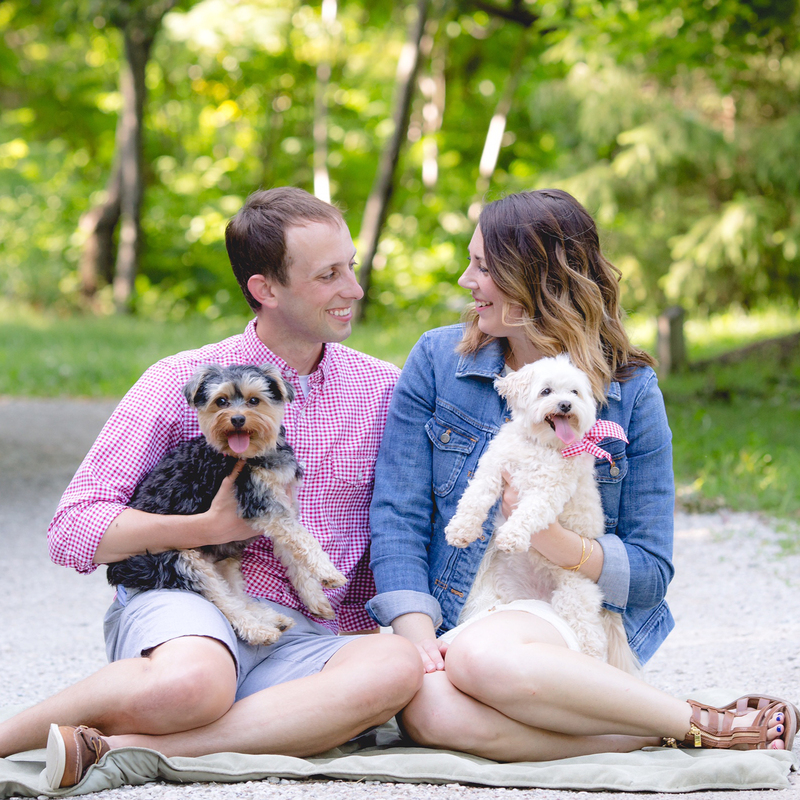 We are Jenna and Logan, husband + wife, Nebraska natives, dog lovers and parents to be. Follow along with us as we begin this new chapter in our lives, sharing everything that inspires us along the way!